Voiceserve INC announced today that Technology Marketing Corporation (TMC®) has named Voipswitch platform as a recipient of its 2009 Unified Communications Excellence Award. “Voiceserve/Voipswitch has demonstrated a commitment to excellence while addressing real needs in the UC marketplace. We are pleased to grant a 2009 Unified Communications Excellence Award to Voipswitch platform,” said Rich Tehrani, CEO, TMC. 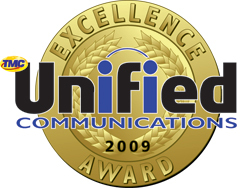 “Congratulations to Voiceserve on receiving this award and we look forward to future innovations.” The complete list of Unified Communications Excellence Award winners are published in the December 2009/January 2010 issue of Unified Communications magazine, www.uc-mag.com. Unified Communications magazine is devoted to educating readers on employing unified communications (UC) solutions. For more information about TMC, please visit www.tmcnet.com.